Last week, my husband and I were out in the garden pulling weeds and getting things ready to lay mulch for the summer. We talked about what bulbs we wanted to plant and which shrubs needed transplanted. So much work was already going into this flower bed and so much work still lies ahead. Every year we do this in hopes of having one of those flower beds that make you feel like you’re in the Garden of Eden! Let’s be honest though…that never quite happens! Don’t get me wrong, it’s still beautiful and well worth the effort. It’s just that it would take a fortune, not to mention the time, to plant something that’s even a fraction of something similar to “The Garden”! We fill in with bits and pieces of what we can afford and set aside small pieces of time to work in our garden to maintain it’s beauty. We take pictures of our labor and share them with our friends and family. We water, pull weeds and take care of each blossom, fruit and vegetable. This whole gardening project made me think of the volunteers in our churches. 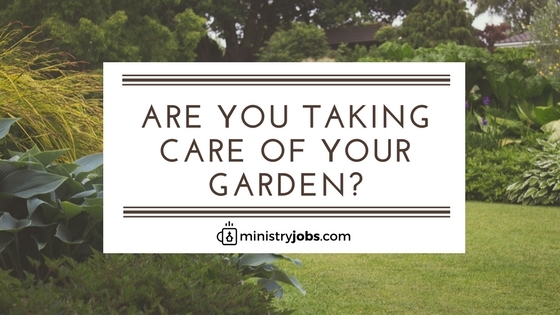 Are you taking care of your “garden”? As ministry leaders, we need to make sure that we take care of the people serving in our ministries and show appreciation for what they do for our churches. These people have jobs, full time…part time…family…activities, yet they’re taking time out of their schedule to serve in your ministry. Have you stopped to thank them? These people get tired and depressed just like everyone else and would probably appreciate an acknowledgement of their service. Just like you, they might even question if they’re really making a difference in the lives of those they’re reaching. How are you taking care of your volunteers? How are you showing them that you appreciate them? If you’re looking for some ideas of your own, check out the small list that I’ve put together below to get you started. Comment if you have a great idea that’s worked. We’re all looking for something new to use to say “Thank You”. From all of us at Froot Group and MinistryJobs, THANK YOU for what you do! Meggan is the Staffing Manager at Froot Group, a worship staffing company.